Palmier Gift Box for sale. Buy online at Zingerman's Mail Order. Gourmet Gifts. Food Gifts. 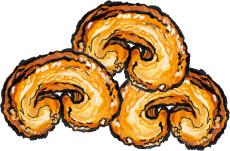 You might call them Elephant Ears, we call ‘em palmiers. Whatever you call them, they’re delicious. Made with lots of fresh butter, sugar and a bit of organic flour, this traditional puff pastry cookie has legions of fans here in Ann Arbor. Now we’re sharing them with the rest of the country. 12 cookies in each box, and each palmier is about the size of your palm. Makes a great gift or treat at your next book club. Grab a couple with your morning coffee. Dunk them into cocoa for a late night snack or dress your next bowl of gelato with a palmier. Very addictive so don’t order any for yourself. You’ll be hooked.